Over the last ten years, researchers have focused on Transformational Leadership as being an effective leadership strategy to implement within public and private sector organizations (Hassan & Hatmaker, 2014; Bednall, Rafferty, Shipton, Sanders & Jackson, 2018; Sattayaraksa & Boon-itt, 2018). This CQ Dossier focus on Transformational Leadership and poses the question on when the theory is effective and ineffective for individual and organizational success. Based on theory and empirical research, the dossier argues that Transformational Leadership is effective in formalized settings yet is problematic in today’s turbulent environment. What are the weaknesses of Transformational Leadership? Intellectual stimulation is the extent to which transformational leaders challenge assumptions, take risks and solicit followers’ ideas (Bass & Riggio, 2006). The transformational leader is someone who can help organisations move forward in achieving a new vision and to head in a new direction (Bass & Riggio, 2006). There is empirical evidence that Transformational Leadership is more effective than Transactional Leadership. In contrast to managers who use transactional methods such as providing contingent rewards in exchange for effort, transformational leaders are more effective in mobilizing their followers to exert extra effort (Bass & Avolio, 1995). There is also empirical evidence that Transformational Leadership (TL) is important in helping to elevate the effectiveness and efficiency within organisations. Boas Shamir and his colleagues reviewed more than twenty studies and found that TL was positively associated with performance (Shamir, Zakay, Beinin & Popper, 1998). Two meta-analytic reviews, also found a positive association between TL and organisational effectiveness (Judge & Piccolo, 2004; Lowe et al., 1996). In another study, presidents of 27 simulated business firms who were described as transformational had higher financial performance in their firms compared to those who were described as transactional (Judge & Piccolo, 2004). Transformational leaders are effective in the vision and mission that they disseminate throughout the organisation. In a survey of 183 entrepreneurs in the woodwork industry, Baum and colleagues found that company visions that were effectively written and communicated throughout the organisation and contained attributes of future orientation and challenge, affected subsequent venture growth (Baum, Locke & Kirkpatrick, 1998). TL is visible at all levels of an organisations. Managers can use empowering language to gain commitment from their subordinates. There is no doubt that CEOs who are transformational have a significant impact on the performance of their organisation mainly because they are positive role models whose behaviours are emulated throughout all levels of the organisation (Waldman, Ramirez, House & Puranam, 2001). Successful CEOs also practice management by walking around and use language that is appropriate for an individual, group, or department. This ability to connect with others regardless of hierarchy is a behaviour that transformational leaders practice daily. Transformational leaders also have close contact with their followers and are authentic in showing their strengths and weaknesses within the firm. TL has been observed at all levels of management. TL can cross hierarchical echelons so is transparent on the shop floor as well as at the top of the hierarchical chain (Bass & Avolio, 1995). The TL framework is comprised of components that incorporate both transformational and transactional leadership (Avolio & Bass, 1994). Most Tl research incorporates scales that measure the degree of TL behaviours such as the widely-used Multifactor Leadership Questionnaire (MLQ) (Bass & Avolio, 1995) which has been revised over time (Bass & Riggio, 2006). However, there have been criticisms of the MLQ with several researchers suggesting that the instrument focuses on the measurement of attributions rather than on actual behaviors (Van Knippenberg & Sitkin, 2013). Another weakness of the TL model is that the framework is relatively static and does not explain the fluctuations between leader and follower or the notion that transformational leadership behaviors can vary over time (Tepper, Dimotakis, Lambert, Koopman, Matta, Man Park, & Goo, 2018). Advances in technology and globalization have also challenged the TL framework through arguing that a more dynamic form of leadership is required for the 21st century. One such theory is Complexity Leadership, which focuses on emergent processes within complex systems and suggests that leadership needs to operate at all levels in a process-oriented, contextual, and interactive fashion (Marion & Uhl-Bien, 2001). To create organisational success, leadership must be “multi-level, processual, contextual, and interactive.” (Uhl-Bien & Marion, 2009, p631). Unlike TL, which focuses on the leader-follower relationship, Complexity Leadership illustrates that the focus is on the social interactions within a network and so anyone within the workplace can become a leader through their social capital. In conclusion, the TL framework is a robust model that provides direction on how to effectively lead in the workplace. A wide range of empirical studied have demonstrated the effectiveness of transformational leadership behaviors. Future research needs to examine the theoretical framework of transformational leadership so that it is geared towards future work innovations. 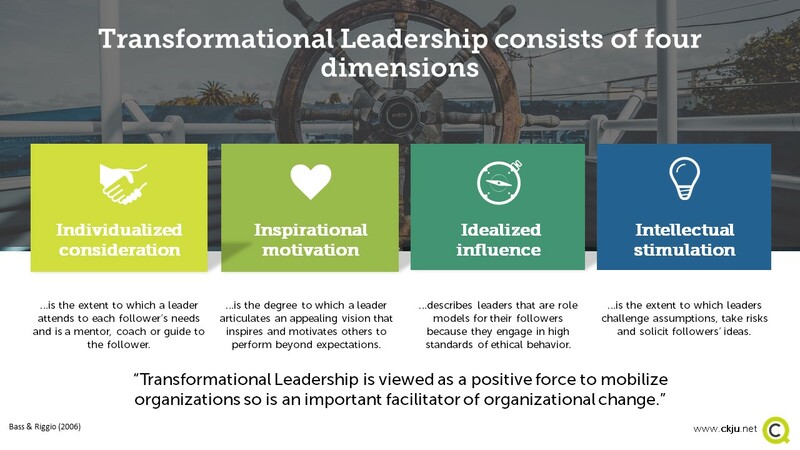 Based on the empirical evidence for the effectiveness of transformational leadership, this dossier is assigned a Level 5 rating, (Based on a 1- 5 measurement scale). A level 5 is the highest rating for a CA Dossier and the evidence provided on the efficacy of a particular construct – in this case transformational leadership. The research performed demonstrates high validity and reliability due to the replication of the positive effects of transformational leadership across a variety of settings and the utilization of experimental and correlational designs. The research is also published in reputable peer-reviewed journals, such as Journal of Applied Psychology. Avolio, B., & Bass, B. (Eds.). (1994). Improving Organizational Effectiveness through Transformational Leadership. Thousand Oaks, CA: Sage Publications, Inc.
Awamleh, R., & Gardner, W. L. (1999). Perceptions of leader charisma and effectiveness: The effects of vision content, delivery and organizational performance. Leadership Quarterly, 10, 345-373. Barth-Farkas, F., & Vera, A. (2014). Power and Transformational Leadership in Public Organizations. International Journal of Leadership in Public Services, 10 (4) pp.217-232. Bass, B. M., & Avolio, B. J. (1995). MLQ multifactor leadership questionnaire (2nd ed.). Redwood City, CA: Mind Garden. Bass, B., & Riggio, R. (2006). Transformational Leadership (2nd ed.). Mahwah, NJ: Lawrence Erlbaum Associates. Baum, J. R., Locke, E. A., & Kirkpatrick, S. A. (1998). A longitudinal study of the relation of vision and vision communication to venture growth in entrepreneurial firms. Journal of Applied Psychology, 83, 43-54. Bednall, T. C., Rafferty, A. E., Shopton, H., Sanders, K., & Jackson, C. J. (2018). Innovative Behaviour: How Much Transformational Leadership Do You Need? British Journal of Management, 29(4), 796-816. Hanson, W. R., & Ford, R. (2010). Complexity leadership in healthcare: Leader network awareness. Procedia Social and Behavioral Sciences, 2, 6587-6596. Hassan, S. & Hatmaker, D. M. (2014). Leadership and performance of Public Employees: Effects of the Quality and Characteristics of Manager-Employee Relationship. Journal of Public Administration Research and Theory, 25(4), 1127-1155. Judge, T. A., and Piccolo, R.F. (2004). Transformational and transactional leadership: A meta-analytic test of their relative validity. Journal of Applied Psychology, 83, 3, pp693-710. Lowe, K. B., Koreck, K. G., & Sivasubramaniam, N. (1996). Effectiveness correlates of transformational and transactional leadership: A meta-analytic review. Leadership Quarterly, 7, 385-425. Marion, R. and Uhl-Bien, M. (2001). Leadership in complex organizations, Leadership Quarterly, 12, 389–418. Northouse, P. G. (2018). Leadership theory and practice (46th ed.). Thousand Oaks, CA, US: Sage Publications, Inc.
Sattayaraksa, T., & Boon-itt, S. (2018). The roles of CEO transformational leadership and organizational factors on product innovation performance. European Journal of Innovation Management, 2, pp227-249. Shamir, B., Zakay, E., Beinin, E., & Popper, M. (1998). Correlates of charismatic leader behavior in military units; Subordinates’ attitudes, unit characteristics, and superiors’ appraisal of leader performance. Academy of Management Journal, 41, 387-409. Tepper, B. J., Dimotakis, N., Lambert, L. S., Koopman, J., Matta, F. K., Man Park, H., & Goo, W. (2018). Examining Follower Responses to Transformational Leadership from a Dynamic, Person–Environment Fit Perspective. Academy of Management Journal, 61(4), 1343–1368. Uhl-Bien, M., & Marion, R. (2009). Complexity leadership in bureaucratic forms of organizing: A meso model. The Leadership Quarterly, 20, 631–650. van Knippenberg, D., & Sitkin, S. (2013) A Critical Assessment of Charismatic—Transformational Leadership Research: Back to the Drawing Board? The Academy of Management Annals, 7:1, 1-60. Waldman, D. A., Ramirez, G. G., House, R. J., & Puranam, P. (2001). Does leadership matter? CEO leadership attributes and profitability under conditions of perceived environmental uncertainty. Academy of Management Journal, 44, pp134-143.